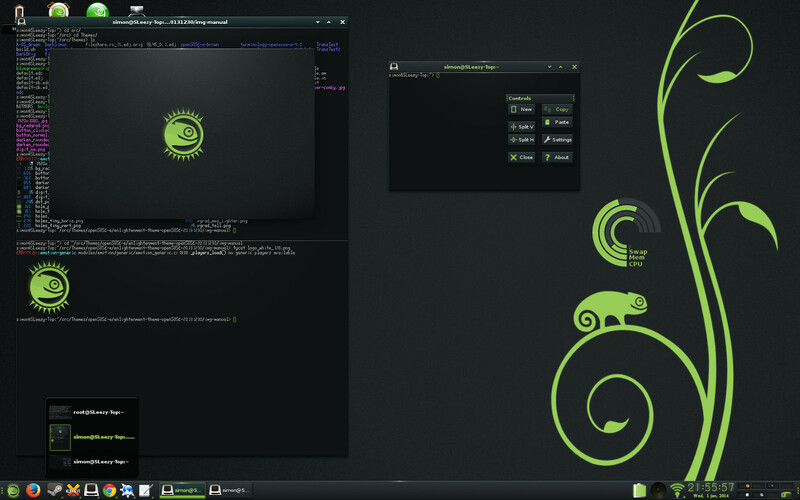 Enlightenment e18 (18.2) and Terminology 0.4.0 are now available on openSUSE. Those who pay attention will have noticed it there for a couple of weeks, but now the openSUSE theme and profile should be working and i don’t think i will be breaking anything again anytime soon. The packages are available from the X11:Enlightenment:Factory repository make sure you have the Enlightenment-branding-openSUSE package installed. 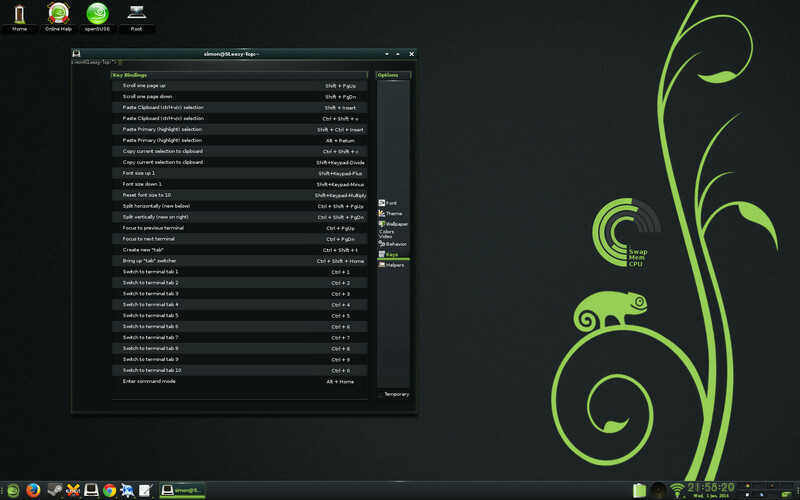 The packages will make there way into openSUSE:Factory over the next little while but with a large number of new packages it might take a while for any non openSUSE users there’s some download links at the bottom. 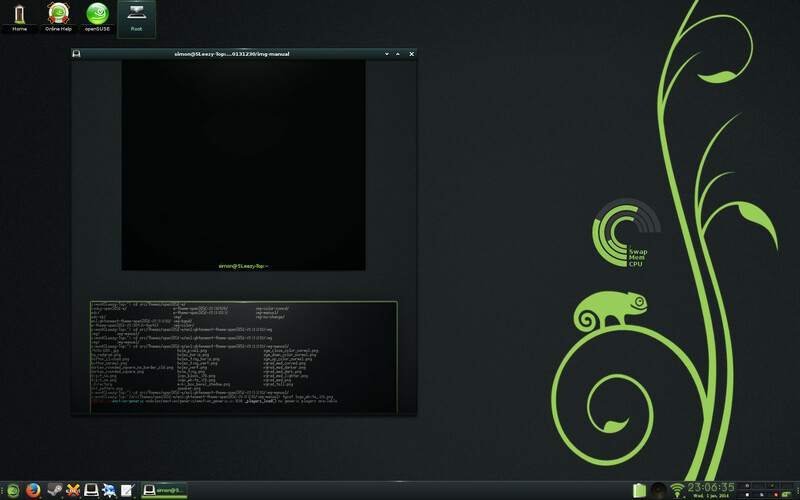 Now for some screenshots, this time i took screenshots using my normal setup rather then the openSUSE profile, the system monitor above the gecko is done using conky which isn’t part of enlightenment the config file is bellow. I tried E18 and there were some real improvements made 🙂 . I had some weird issues caused probably by compositor and thus probably related to graphics driver. So I had to switch back to E17, where compositor can be disabled. Dear users, if you want to migrate to E18 back up your ~/.e dir first so you can switch back if needed. It is my preferred DE, but since it is not available from dvd yet, I have to get it up on KDE. Our aim has been to be on the DVD for 13.2 but that probably won’t have connman because we are struggling to find someone with time to give it the proper security check. You could have a play with SUSE Studio to create a DVD, thats somewhere right at the bottom of my if i get a chance list but i’d be happy to help someone else do it. Any chance for an update to 0.18.4? I have install the packages, but there is no xsession listed for e18 listed in my DM. Hi which DE are you using, and which repository and version of enlightenment have you got installed? and what do you have in /usr/share/xsessions ? Any news regarding including Enlightenment in 13.2? Unfortunately there’s not room for enlightenment on the DVD but it is included in the repo’s once you have done your installation you should be able to install the package “enlightenment” for e19 (recommended) or the package “e17” for e17 (Much less tested). 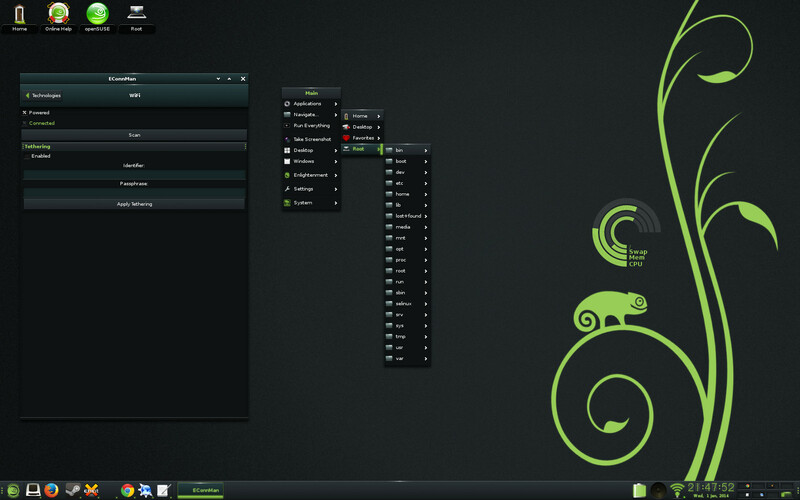 After i’ve finished sorting out release stuff and a couple of other things i might look at using SUSE Studio to put together a openSUSE 13.2 iso with enlightenment on the disk.